Making ordering food from local restaurants a breeze for you from the convenience of your home, office or anywhere you may be, TasteAway is the solution to the digital age of takeout. There are days when I just don’t have the time or energy to make a delicious home-cooked meal for my family and also special days we call “Movie and Munchies” night in our home where we order some food and enjoy a great night in (usually on a Friday). Sure ordering over the phone can be quick and efficient but put into consideration I have 2 little ones with one in particular that deliberately enjoys raising her voice or wanting to talk a little more extra to mommy when I happen to be on the phone. So how does TasteAway work? If you’ve got internet access, you can order. I actually used my iPhone to place this order and it was extremely easy! Once you’ve created your account with TasteAway, simply enter your address in the Search field and a list of local restaurants within close proximity will pull up for you. Delivery Minimum, Delivery Fee (if there is any), Distance (to your location), Show on Map and whether it’s for Delivery/Pick-up or just Pick-Up Only. 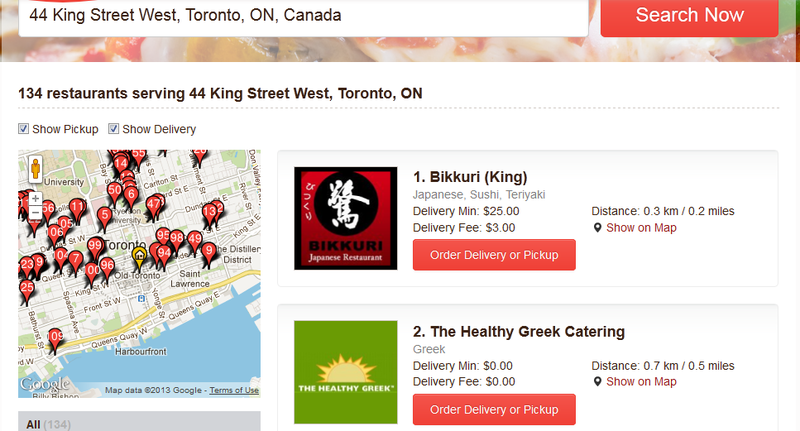 On the left of the screen it categorizes each restaurant according to Type of Food (i.e. Chinese, Greek, Italian, Breakfast, etc.). Another great thing is that they offer Live Chats on the site should you have more questions or difficulties. Not sure what you are craving for? Click on the Crave Tab! It will provide a delicious variety of dishes at different restaurant to help you out. Once you’ve chosen which restaurant you want to order from, simply build your perfect meal and let TasteAway take care of the rest for you. They will send it to the restaurant for you and send you a confirmation via email which includes details of your order, the time it was ordered and what time it’s expected to be delivered. You have a choice of paying cash upon delivery/pick-up or with a credit card. Does not have description of dish. I would love it if you clicked on a dish during the ordering process and it would have a description of the dish. Many of the restaurants tend to be pick-up only and will only deliver till after a specific time, usually in the evening. What about during lunch? If you have free food credits you cannot use them if paying cash, only if using credit card. I would also love to see them include PayPal. If you invite friends, every friend that orders you get $5 of free food. Nice! 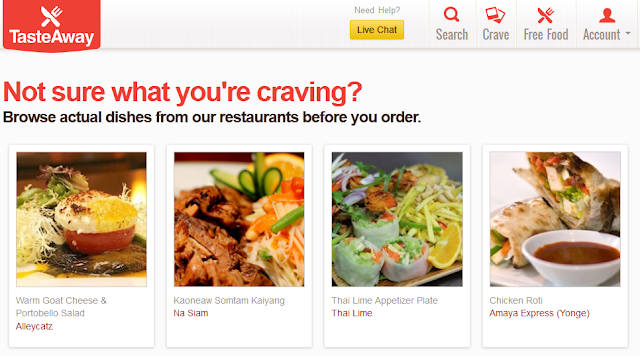 You can visit TasteAway here: http://www.tasteaway.com and get started. 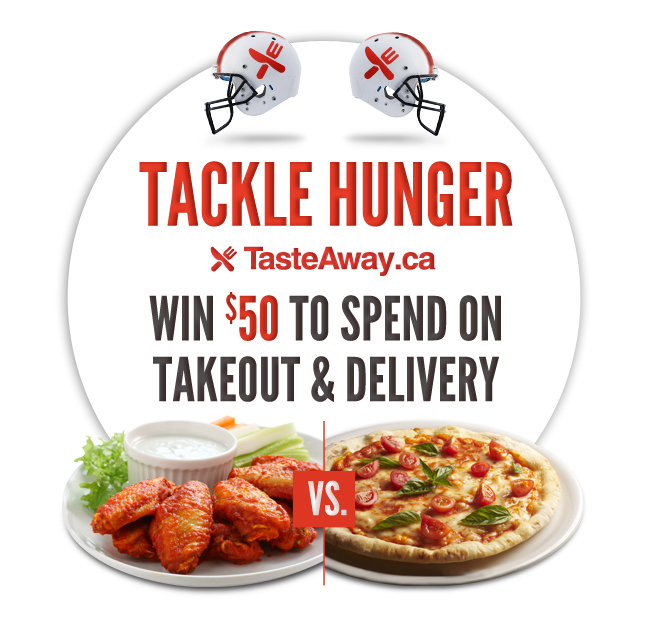 And because I adore my readers and in light of the upcoming Super Bowl, TasteAway and Carol Au Courant is helping you tackle your hunger with a $50 Credit to enjoy towards a delicious meal (or two) and/or help feed your Football-loving crowd! This is giveaway is only for 2 DAYS and ends Friday, February 1 at 5pm EST, so enter today! **Please note that because TasteAway is currently in beta phase, you must be located in the Toronto area to take advantage of this giveaway. To be eligible to win simply enter via Rafflecopter below. Chicken Roti from Amaya Express! Teriyaki Chicken Hotpot — I love hotpot! I am craving the Shrimp Magic from Magic Oven. Salmon Magic from Magic Oven looks sooooo delish!! The Curry Katsu from Bikkuri (King)! The Rainbow Roll from Fukui Sushi!